This is a remarkable cartoon, albeit tragically still in 2008. 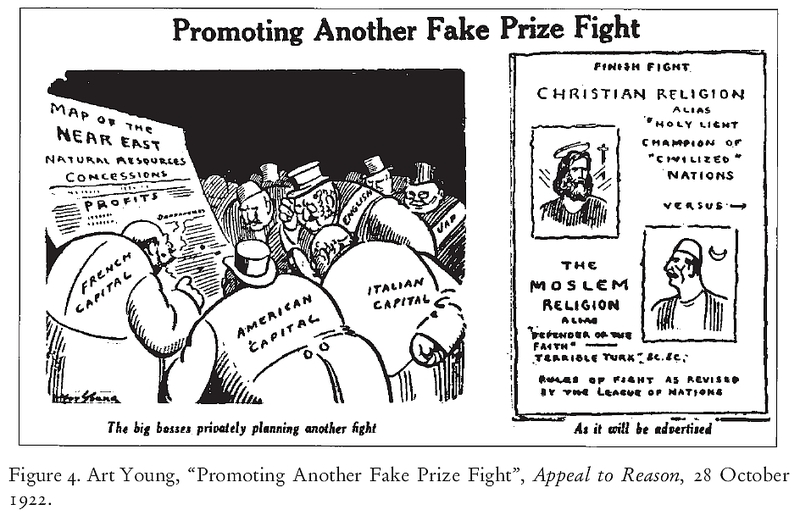 From radical leftist cartoonist, Arthur Henry Young (in Michael Cohen, “‘Cartooning Capitalism’: Radical Cartooning and the Making of American Popular Radicalism in the Early Twentieth Century.” IRSH 52 (2007): 35-58, 45). The violence intrinsic to Capitalism continues unabated, and will do so until it is forcibly overthrown. Saudi Cleric Muhammad Al-Munajid Declares Micky Mouse Must Die! Anglican Archbishop of Canterbury, Rowan Williams wrote ‘A Common Word for the Common Good’ (a letter to Muslim leaders and scholars) on July 14, 2008. In one part of the letter he explains the Trinity affirms God’s oneness and self-sufficiency while not positing any other beings alongside God (consistent with the teachings of Islam), yet further affirms that the divine life is lived “as three interrelated agencies” (the Christian peculiarity, par excellence). 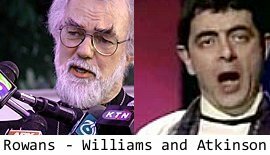 Williams is quite orthodox. “… ‘God’ is the name of a kind of life, a ‘nature’ or essence – eternal and self-sufficient life, always active, needing nothing. But that life is lived, so Christians have always held, eternally and simultaneously as three interrelated agencies are made known to us in the history of God’s revelation to the Hebrew people and in the life of Jesus and what flows from it. God is at once the source of divine life, the expression of that life and the active power that communicates that life. This takes us at once into consideration of the Trinitarian language used by Christians to speak of God. We recognise that this is difficult, sometimes offensive, to Muslims; but it is all the more important for the sake of open and careful dialogue that we try to clarify what we do and do not mean by it, and so trust that what follows will be read in this spirit. But that’s not what you’d understand from the media reports of Rowan Williams’ letter, which have been wilfully (or perhaps ignorantly) inaccurate — much like the general misreporting of his comments on sharia law. And of course, the comments by readers of these newspapers misrepresent his comments even further. Happy 4th of July! Remember, do what we say, or we’ll bring democracy to your country. I have always enjoyed Salman Rushdie’s books. My personal favourite, for quirky reasons — it appealed to me in many ways — is “The Moor’s Last Sigh”. I got it at a book-signing at which the author signed books and didn’t appear (he was hiding from certain Muslim nutjobs). 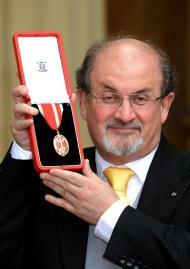 With the conferment of a knighthood on Sir Salman Rushdie on Wednesday June 25, 2008, it is time to remember the ‘satanic verses’ – which Muhammad claimed Satan originally tempted him to place in the Qur’an. As the story goes, Allāt, al-‘Uzzā and Manāt were three Arabian goddesses, who were worshipped at Mecca before Muhammad took over. In an incident referred to as ‘the Gharaniq incident’, Muhammad wrote in one of the suras in his Qur’an (the 53rd; Al-Najm) that these goddesses could provide intercession. He was adopting the old monotheistic trick – rather than dismiss the other gods, it’s better to simply assimilate them into your new religion. But he later had a change of heart and claimed that these words had been inspired by Shaitan (Satan). (“these are exalted birds whose intercession is to be desired”). Why did Muhammad later claim these verses were inspired by Shaitan? The conclusion on that seems to be that his monotheism was heightened later on in his life, and so the “satanic verses” needed to be erased. And they were erased. They don’t appear in copies of the Qur’an today. The story is most likely to be historically true, given the criterion of embarassment which would prevent a Muslim from inventing such a maligning story about Muhammad, and the inexplicability of a non-Muslim inventing the peculiarities of such a story. The satanic verses provide a really interesting example of textual and theological development within the Qur’an. This is precisely the reason why Qur’an inerrantists try to deny the truth of the story. For those lamenting the pervasive influence of dogmatic theology on biblical studies, the world of Islamic scholarship is a whole different level of tendentious nonsense. “And We did not send before you any apostle or prophet, but when he desired, the Shaitan made a suggestion respecting his desire; but Allah annuls that which is cast”. The Qur’an, like any other work of a person written over a period of two decades or so, demonstrates the changes and developments in its author’s opinions and ideas. 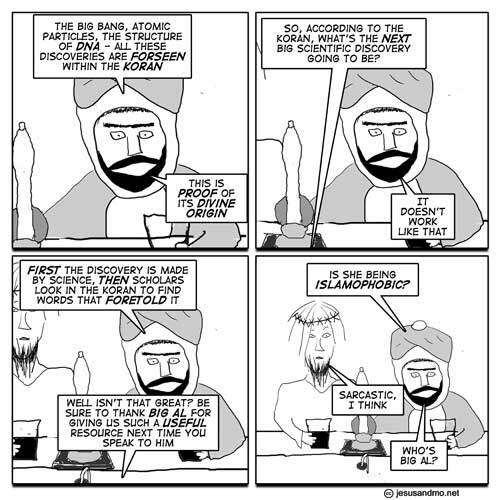 Muslim pop-apologists are often keen to say that the Qur’an contains some truly amazing scientific knowledge that has only recently been discovered by scientists. As your average seventh-century Arab couldn’t have known such things by him- or herself, the Muslim apologists go on to argue that this is sure evidence of divine inspiration. There are quite a few websites that spin this nonsense, and I’ve heard it in about four talks I’ve gone to by Muslims. And I can only remember four talks by Muslims I’ve ever gone to. Did you realise that the physiological widening of the birth canal was known in the Qur’an? And did you know the Qur’an always knew about black holes? Of course, this all takes some fairly imaginative interpretation of the Qur’an, in order to stretch the words until they seem to fit the parlance of modern scientific claims. I’ve always thought it was a little desperate, and while it doesn’t say much about the credibility of the Qur’an one way or the other, it does say something about the credulity of some of its followers. I spotted this on Jim West’s blog. The right to free speech has been under attack since September 2001, with an increasing amount of ‘anti-terrorist’, ‘state secrecy’, ‘defamation’, and ‘media censorship’ laws. The police will, on top of this, frequently overstep the power given to them. And this is what occurred here. If there are Muslims in the United Kingdom who cannot deal with an American Christian missionary giving out bible tracts on an open street corner, I say send them even more Christian missionaries! Keep sending them until they can recite the Four Spiritual Laws by memory!! The thing about free speech is that, given enough of it, you will find you can just ignore the dumb stuff that you’re not interested in. Easy, huh?